Thanks to the Laura and Larry and the on10 team for taking the time to talk to us! Take a look over at on10.net. Posted by brad at 2:52 pm on November 29th, 2006.
v1 shipped with three Inbox views – Prioritized, Prioritized by Week, and Prioritized by Day. All three views color coded email via our prioritization algorithm, sorted messages by the priority score, and grouped conversation threads together. It became clear to us early on that this was a lot of change for our customers to take in straight out of the box, so in v2 we implemented several, more traditional date-ordered views (see view descriptions here) and made the Threaded View (color coded by priority, ordered by date, with threads grouped together – a suggestion of Jason Clarke’s) the default. It was my hope that this view would give customers a chance to get accustomed to our prioritization system before shifting to a view of the Inbox based on priority rather than date. I encourage all of you to take another look at the views available via ClearContext > Inbox Views > View Selection Wizard and make sure that you are using the one that works best with your workflow. I personally prefer Prioritized by Week (grouped), but when I’ve been out of the office for a while or the email is starting to build up I usually switch to the Prioritized by Day view to crank through the day’s work. Also, remember to click Reset Inbox if you change a view by clicking on a header – this will ensure that the view remains ordered and grouped by conversation. In Outlook 2007, we have resolved the issue where filing to offline SharePoint folders results in a conflict. In Outlook 2007, views no longer appear corrupted when saving them. Exchange 12 Beta users can now use the Defer feature without losing the sender name. Deleting or moving large numbers of messages is more efficient. There are also a few additional performance enhancements in this release. If you are running v3.0.4, I recommend you download and install the update to resolve the above issues. UPDATE: The installer issue previously reported is fixed – there should be no need to uninstall the application when upgrading from an earlier version. We have also created a build that will allow ClearContext to load for Windows Vista users who are running as an Administrator with UAC off. If you are running Windows Vista and ClearContext does not run after install, please see this page for more details and a link to the download. 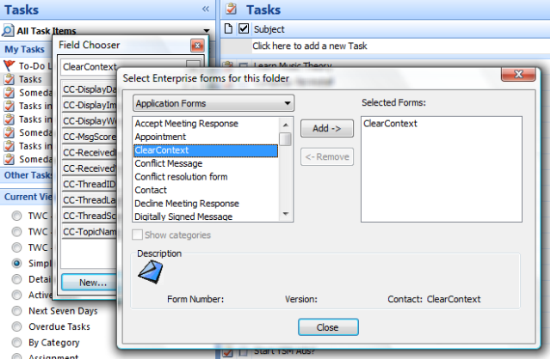 In the “Select Enterprise forms for this folder” dialog select Application Forms. If desired, change the name of the header on this field by right clicking “CC-TopicName”, selecting Format Columns, and changing the Label. Repeat for each task view that you want to alter. For more detail, see our User Guide. For more information on how our customers have used ClearContext to implement their GTD practices, see this post in our Features and Support Forums. Fixed: If you perform a search on All Mail Items, the ClearContext toolbars become disabled. To re-enable, restart or perform a local folder search, then click on the Inbox. Fixed: When launching an item (task or appointment) from an open message, the value for “Original Message” is not populated and sometimes the ActionView icon does not appear. Fixed: Some recipients using older email clients (Eudora 5 or earlier, some MAC clients) will see winmail.dat attachments on their messages. In Outlook 2007, If you are offline, filing to SharePoint folders using IMS will result in a conflict. The message is sent to the Local Failures folder instead. In Outlook 2007, saving an Inbox view via the ClearContext menu can result in a corrupted characters appearing in Inbox messages. Clicking on another folder and back on the Inbox fixes the view. Exchange 12 Beta users running online will note that the Defer function is stripping the From field from email. This is not a problem offline or in Cached Exchange Mode. When selecting a large number of messages and deleting or issuing the Move to Folder command, Outlook takes a long time to complete the operation, sometimes appearing to hang. This will be fixed in a future release. In the near term, drag messages to the their destination instead of using the Delete or Move to Folder commands. Windows Vista users running with Administrator rights with UAC turned off cannot run the software. The only workaround at this time is to turn UAC on or change your user rights to Standard. We have a workaround for this in testing as well, though the easiest solution will continue to be either turning UAC on or switching the rights of your User Account to Standard. I’ll update the weblog when the point release is available for download. Thanks to everyone for helping us test and build on Microsoft’s pre-release software. Posted by brad at 12:08 pm on November 14th, 2006. Google Taking Cues From ClearContext Again? It is always rewarding to see ClearContext features validated by one of the big email providers. Though, as Deva points out on Email Dashboard, it was really Omar Shahine’s suggestion that led us to build Unsubscribe from Thread in the first place. Posted by brad at 12:48 pm on November 13th, 2006. In the 3.0 release, we have improved the way ClearContext resolves Exchange addresses. In v2, when using AutoAssign or assigning contact priorities, many of you noted that IMS handled internal exchange mails differently than external SMTP addresses. For example, an AutoAssign rule set to look for “myboss@mycompany.net” might not pick up an Exchange email from “My Boss” (with an Exchange address something like “/o=mycompany/ou=first administrative group/cn=recipients/cn=myboss’). IMS 3.0 now recognizes that both of these addresses belong to the same person and processes accordingly. 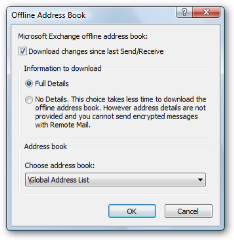 To take advantage of this functionality, make sure that you have downloaded your corporate address book into Outlook. To do so, select Tools > Send/Receive > Download Address Book, check “Download changes since last send/receive,” press the radio button next to “Full Details,” and hit OK.
Posted by brad at 3:42 pm on November 8th, 2006. We have completed our 3.0 changes to the user guide and posted them to the website. I’ve also got a downloadable PDF available if you want to print a hard copy. Enjoy! Posted by brad at 6:22 pm on November 7th, 2006. I am very pleased to announce that we have officially released ClearContext IMS 3.0! Check out the new product demo here. ClearContext’s IMS Pro Application Manages Information Overload for Users to Address the Increasing Volume and Complexity of Information in the Workplace. 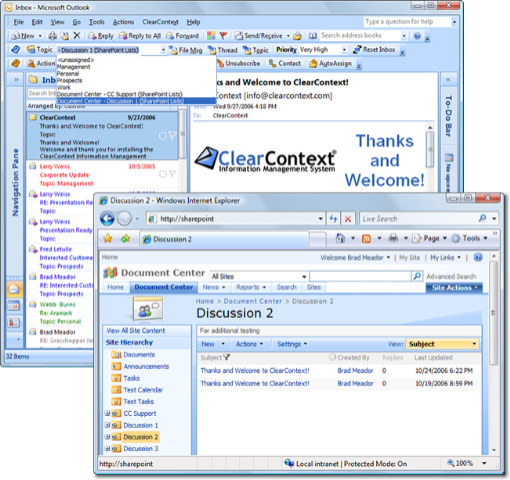 San Francisco, CA – November 6, 2006 — ClearContext Corp. today announced the release of Information Management System Pro (IMS Pro) v3.0, an application that extends Microsoft Outlook to quickly and efficiently manage related email, tasks and appointments. IMS Pro is an automated personal email assistant fully supporting Microsoft Outlook 2007 and prior versions, extending email management capabilities to integrated task and schedule management including sharing into Exchange and SharePoint. IMS Pro automatically analyzes email and highlights, prioritizes and groups the most important new messages in your inbox, as well as screens unwanted messages out of the inbox. IMS Pro allows users to “unsubscribe” from unwanted conversations that often occur as a result of group emails or distribution lists, preventing responses from cluttering the inbox. 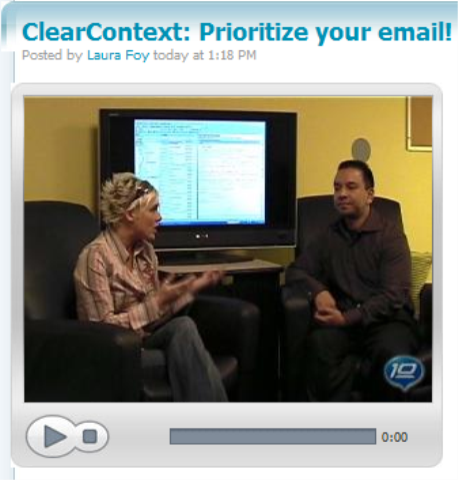 Prioritization – analyze incoming email to highlight the most important messages. Messages are ranked and color-coded by priority according to customizable rules that are based on email characteristics such as sender and level of participation in the conversation. The most important emails are placed at the top of the inbox to be dealt with immediately, while junk emails are moved to the bottom of the inbox. Categorization and filing – assign topics to email conversations and with one click, quickly file individual messages or entire conversation groups into folders. Existing and incoming emails within the same conversation are automatically tagged with their appropriate topics. Project organization – convert emails into connected tasks or appointment items with a single click, and easily view all project-related items together. All messages related to a single project, both incoming emails and replies, can be automatically filed to appropriate folders. IMS Pro takes advantage of new capabilities in the 2007 Microsoft Office System to display all related task and appointment items directly within the email message window in Outlook 2007. Time management – users can “delegate” emails to other users or “defer” emails to be viewed at a later time. Messages are temporarily removed from the inbox, filed appropriately and automatically posted back into the inbox at a later designated time – essentially an email snooze button. Collaboration – automatically file information to shared Microsoft Exchange Public Folders. Taking advantage of the integration capabilities of the 2007 Microsoft Office System, Outlook 2007 users can also file email messages directly into Microsoft SharePoint sites. ClearContext IMS Pro v3.0 is priced at $79.95 per single-user license. A free 30-day trial, including a free copy of ClearContext IMS Personal Edition, can be downloaded at www.clearcontext.com. Posted by brad at 9:00 am on November 6th, 2006. Here’s more user guide documentation I’m working on. This shared filing stuff is pretty cool (if I do say so myself) and a good portent of more things to come in our product line. 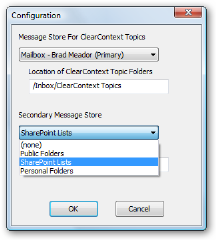 ClearContext allows the designation of a secondary message store (such as SharePoint Lists in Outlook 2007, Public Folders, or an alternate Personal Folders file) as a secondary Topic Folder repository for easing sharing of message conversations outside of the primary mail file. Designate the secondary message store via the Configuration panel and ClearContext will automatically convert folders within the datastore to Topics. 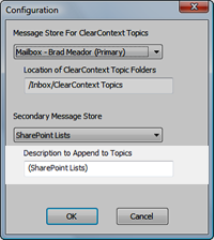 These shared Topics can then be assigned to message conversations and ClearContext’s file buttons will automatically move messages to the alternate location. To designate a secondary datastore, open the ClearContext Configuration menu at ClearContext > Options > Configuration. 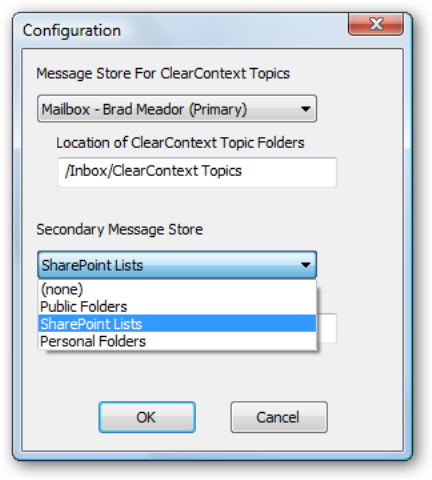 After a restart of Outlook, ClearContext automatically populates the Topic list with folders in the datastore. Select Public Folders to share to Exchange Server public folders. ClearContext will convert all Mail and Post public folders into Topics, while ignoring folders of other types (Contacts, Tasks, etc.). 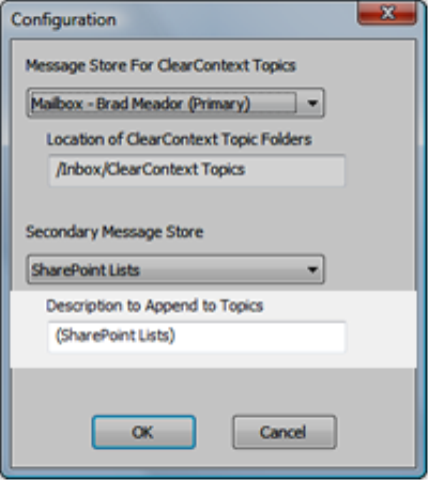 Select SharePoint Lists to instruct ClearContext to recognize SharePoint discussion lists that have been connected to Outlook 2007. To connect a SharePoint discussion to Outlook 2007, open the discussion site in a browser and select Actions > Connect to Outlook. This feature is not available in Outlook 2003 and earlier. Select an archive or personal folders file to share to an alternate mail file. On startup, ClearContext will scan the the PST and convert all Mail and Post folders to Topic folders. After adding a folder to the alternate PST, restart Outlook for ClearContext to convert the new folder to a Topic. After a secondary message store has been added via Configuration, shared folders automatically appear at the bottom of the Topic list. Shared Topic assignment and filing then works exactly like Topic assignment using primary Topics; assign a shared Topic and all current and future messages in the conversation will be assigned that shared Topic. Use any of ClearContext’s filing buttons to automatically move these messages into the shared message store. In the Topic list, ClearContext automatically appends a suffix at the end of each shared Topic. The defaults are “(Public Folders)”, “(SharePoint Lists)”, and the name of the alternate PST file that is selected. This description can be changed in the configuration window (ClearContext > Options > Configuration). Posted by brad at 12:15 pm on November 3rd, 2006.